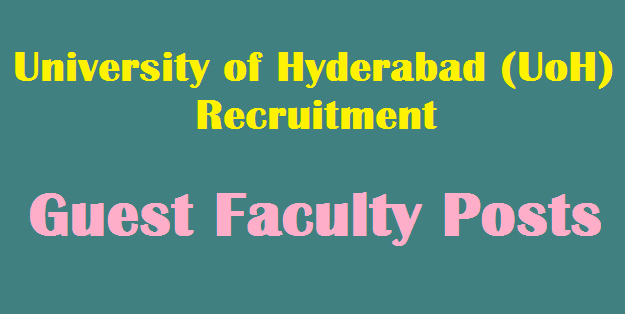 University of Hyderabad (UoH) Recruitment 2018 - 07 Guest Faculty Posts, The School of Management Studies, University of Hyderabad invites applications for appointment of 07 Guest Faculty Posts in School of Management Studies to teach the students of MBA General, MBA (HC & HM), MBA Business Analytics II and IV regular semester students on a consolidated pay.The selected guest faculty are expected to participate in other academic activities like seminars etc.. and provide guidance to students and extend any other type of help as may be needed by the students and as assigned by the Dean of the School.Further they are also expected to undertake teaching and student mentoring and not leave in the middle of the semester.University of Hyderabad (UoH) Recruitment 2018 detais are given below..
i. Qualifications: The applicants for applying MBA General, MBA (HC&HM) & MBA Business Analytics must possess teaching/practical experience of more than 10 years in the field of Health Care/Hospital management preferably with a Ph.D. Degree. For the regular MBA, the applicants must possess Industry/Teaching experience of more than 10 years. However in case of Doctors/Professionals the relevant experience in working in Health Care / Hospital Sector will be treated as equivalent to Ph.D. Degree. ii. Title: Project Management, Revenue cycle Management. Health Economic. Patient Care Servicesc, Data ware house & Olap. Data Mining. Data Visulization.